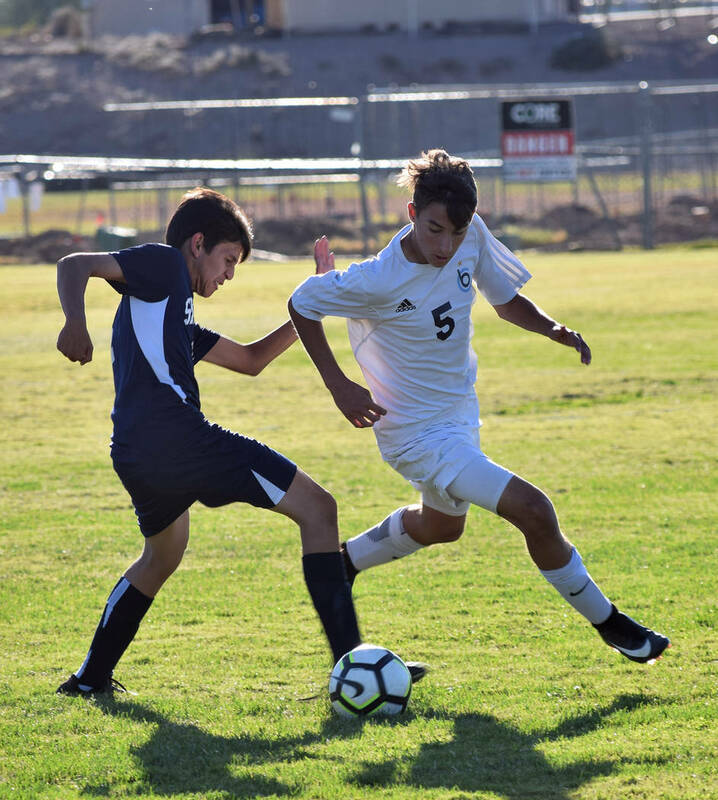 Boulder City High School’s freshman boys soccer star Julian Balmer and girls sophomore star Madison Manns were each selected to the All-Sunrise Conference second-team after leading their respective program’s youth movements. Robert Vendettoli/Boulder City Review Julian Balmer, right, a freshman at Boulder City High School, was named to the All-Sunrise Conference second team for his performance with the Eagles soccer team this season. He led the team with 10 goals and three assists. Helping the Eagles improve with an extra two wins (5-10-2) this season, Balmer was the team’s key catalyst on offense with a team-leading 10 goals and three assists. Leading the girls in goals this season, Manns proved to be an all-around threat for the Lady Eagles, scoring nine goals, while dishing out five assists. As a freshman, Manns was a first-team All-Southern Region selection after leading the team with eight goals and three assists, making her one of the state’s top underclassman. Capturing their first 3A state championship in school history last season, Boulder City High School girls bowling figures to contend once attend despite losing two key seniors. Senior Bailey Bennett-Jordan and sophomore Christine Smith are expected to lead the way for the Lady Eagles after both bowling 459 in last season’s final. Junior varsity returners, senior Camille Torgesen and junior Samantha Wagner, are expected to round out the team’s starting rotation. Hopeful to earn leading roles and continue the winning tradition for the boys program, junior Sam Holt returns as the Eagles’ lone starter, routinely bowling in the high 470s last season.